Joseph A. Saragusa, born Jan. 17, 1926, Kansas City, KS, entered the USN on March 6, 1944. He was stationed in Farragut, ID, at Camp Ward, Co. 299. He was then assigned to the USS West Virginia, 11th Div., serving in the Pacific during WWII. He received the medals accorded during that time. 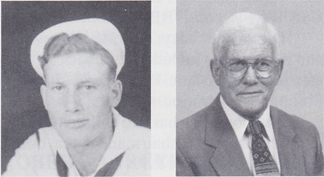 He also served on the USS Rocky Mount (AGC-3) and was discharged March 9, 1946. Saragusa retired from TWA on Feb. 1, 1988, after 32 years of service. He is a coin collector and collects rocks from different states and countries. He and his wife, Helen, live in Overland Park, KS. They have been married 50 years and have four children: Kathy, Sandy, David and Gary. They also have six grandchildren: Cory, Evan, Candace, Nick, Beth and Ashley.